Slush-style Floor Mats are molded in color and feature deep ribs to trap and hold water, snow and mud to protect your carpet and keep it clean. A must during inclement weather. Slush Mats work great in all seasons. Complete set of four (front and rear), Unique design with Jeep Logo. Mats fit perfectly, & the price was very good. The mats fit perfectly in 2011 Jeep Liberty. Others advertised elsewhere do not fit or cost a lot more. Only issue was with website when placing order. Had some trouble with differentiating between ship to & bill to addresses which caused product to be shipped to wrong address. Color matches the interior brown very well. Fit is very good but could cover a bit more carpet area for more protection. They fit and look great. Definitely better than the original and cost less too. Awesome item and they fit perfect! So much better then carpet. I can see these lasting years. Mats fit perfectly! No need to buy Weathertech or Husky type mats. These are good to go, and make a nice addition to my Jeep Liberty. Shipping was quick, and packing more than adequate. ProsGreat fit. Could not be more happy with the mats. The floor mats fit perfectly, as advertised. Arrived promptly. Excellent service. These mats are ok for the price. I thought they came up further on the sides to prevent liquid from spilling over the sides. 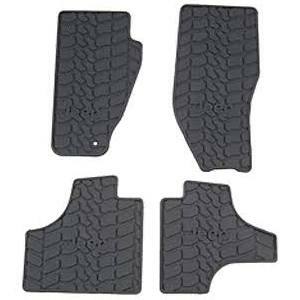 These floor mats are heavy-duty and very practical. Anyone who travels off-road or contends with snow will love these.